Bring ease in the life of someone you love with exclusively designed aprons online at FlowerAura. Whether it's your mother, wife or anyone you are thoughtful about, gift this perfect gift and encourage them for their efforts. An excellent present for all Kitchen lovers, FlowerAura has in stores a wide range of Aprons for women. These custom aprons come with a sweet message and are a unique way of expressing. Forming a perfect gift for women who love cooking, these kitchen aprons will show your thoughtfulness towards your special people. Truly, a much loved gift for Mother on Mother’s Day. FlowerAura’s Custom aprons are sure to make your special one the star of the kitchen. With many meaningful messages imprinted, these printed aprons with pockets are a perfect complement to their cooking skills. With cute yet professional look, they are sure to create an impression on the recipient. These kitchen aprons make great gifts for women who love to spend time in the kitchen no matter what their skill level may be. Therefore, in order to boost the skill of someone who is dear to you, buy aprons online at FlowerAura and have them grinning incessantly. And trust us, each time they adorn the cooking apron, they would think about you and would thank you to the core. For Whom You Can Order These Cute Aprons Online From FlowerAura? One thing that we miss the most about Moms apart from the enormous love she bestows upon us since childhood, is Mom’s food. No matter what happens, no matter where you go, you just cannot do away with the craving of Mom cooked food. 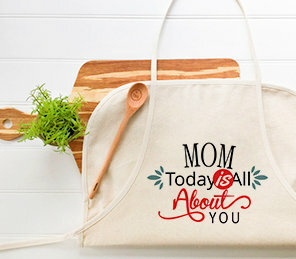 So, gift your chef mother the gift of a custom chef aprons that she can wear as a remembrance of your sweet feeling while she cooks delicious food for you or your favorite dish. The best part is that these aprons do not make suitable options just for women but happen to be amazing gifts for boys who are absolute best cooks. We have custom printed aprons to spoil you with choices. And the best part is, you do not need an occasion to surprise them with cute aprons. You could order these kitchen aprons online at FlowerAura on any given day to pamper and encourage someone you are proud of. With FlowerAura, you can order these printed aprons for your Father and surprise him on any given day or special day as father’s day gifts. We have paired them with divine statues, chocolates, greetings and more to make a real beautiful surprise present. The best part about ordering kitchen apron online from FlowerAura is that we assure timely delivery of our products and we take pride in our strong delivery network across the nation. Simply make a pick from the wide array of products and choose your favorite combination of printed aprons, be it with themed cushions, handmade chocolates, divine statues, or more options, and proceed to check out where you can place an order. This unique gift is not something you could find everywhere. FlowerAura has the best quality of custom printed aprons to help you express your encouragement with ease. FlowerAura offers home delivery of your gifts so that you can sit at the comfort of your home and order the thoughtful gift for someone dear. With the option of fast delivery, sit at ease because your gifts shall be delivered right on time. You can also visit our coupons page to find the latest deals and offers and whoa! Your work is done. With the plenty of customized gifts online at FlowerAura, now sit back and relax because we, at FlowerAura, will ensure that your gift reaches on time to your special person and brings a huge smile on their face.